For Mother’s Day this year, I was fortunate to combine a few of my favorite things: travel, quality time with my son, and a museum visit. This time around, it was a Georgia O’Keeffe exhibition at the Brooklyn Museum — an inspiring collection of artifacts, stories, and paintings from a woman who led an extraordinary life by all accounts of the word. While many museum and gallery visits give me feelings of intimacy and inspiration in life, art, and design, this particular exhibit touched my soul on a deeper level than I could’ve predicted. Georgia O’Keeffe was a woman. An artist. And a true force of nature. I’ve debunked many-a-myth before when it comes to what branding is. It’s more than your logo; it’s more than just you. But witnessing what Georgia O’Keeffe was able to create dives even deeper into the realm of personal branding, and what exactly that means. For O’Keeffe, she embodied her brand in every aspect of her life, choosing to set herself apart through more than just her art. 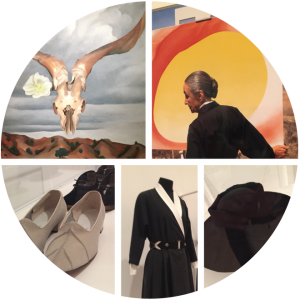 She was intentional in her clothing, carefully curating high-quality pieces predominantly in black-and-white until later in life when the Southwest opened her to more colors. She was intentional in where she lived, choosing her house in Sante Fe because of the shape of the doorway. She was intentional in her makeup, or lack thereof — choosing to stay fresh-faced and makeup-less for her entire life. She was intentional in her style of painting, choosing to forgo utter consistency and often alternating between realistic and semi-abstract. She was intentional in how she was photographed, often staging the pictures just so and turning to only the best photographers — like Alfred Stieglitz (her husband) and Ansel Adams, as well as strong women like Annie Leibovitz. In a pre-Instagram world; a world where “personal branding” did not yet exist, Georgia O’Keeffe intentionally created a brand that epitomizes the concept of branding itself. By carefully curating not just what she allowed into her life, but also what she put out into the world, O’Keeffe created a remarkable legacy that will likely forever reserve her space as a household name. This, friends, is an impact we can all learn from — whether we’re business owners seeking to make change through our work, artists dedicated to creating statements, or human beings on the not-so-simple mission to leave the world just a little better than we found it. You may not be an artist who appreciates O’Keeffe’s art on the visceral level that many of us do, yet any strong business owner — or human, really — can certainly appreciate her (perhaps unconscious) grasp on what a brand is all about, and the intentionality with which she designed every aspect of hers. Get intentional. It may mean stepping outside your comfort zone. It may mean making tough choices. But it also may just mean leaving your mark on this world in only the way you can.